The term thermistor comes from “thermal” and “resistor”. A thermistor is a type of resistor whose resistance is reliant on temperature; it’s a resistance thermometer. They’re made from metallic oxide which is moulded into a bead, disk or cylindrical shape and then enclosed with epoxy or glass. Thermistors don’t work well with extreme temperatures, but they are perfectly suited for measuring temperature at a certain point; they’re precise when they’re used within a limited temperature range i.e. within 50 °C of the target temperature; this range is dependent on the base resistance. Thermistors are easy to use, relatively cheap and durable. They’re commonly used in digital thermometers, in vehicles to measure oil and coolant temperatures and in household appliances such as ovens and refrigerators and are preferred for applications that require heating or cooling protection circuits for safe operation. The thermistor is built in for more complex applications such as laser stabilisation detectors, optical blocks and charge coupled devices. For example, a 10 kΩ thermistor is the standard one that’s built into laser packages. 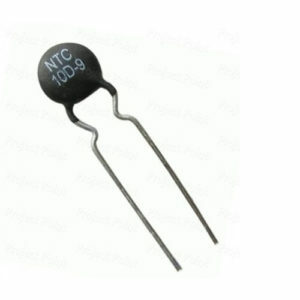 There are two types of thermistors – the most commonly used is the Negative Temperature Coefficient (NTC) thermistor. The NTC’s resistance decreases as the temperature increases, and vice versa. 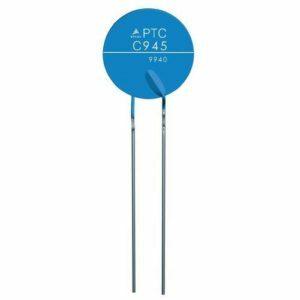 With the Positive Temperature Coefficient (PTC) thermistor, the resistance increases as the temperature increases, and vice versa; it’s normally used as a fuse. The type of material used in the thermistor will dictate how much the resistance changes, which is changed with temperature. Thermistors are nonlinear i.e. the connection between resistance and temperature won’t form a straight line, it will form a curve on a graph; where the line sits and how much it changes depends on how the thermistor is made. How is the change in resistance converted to measurable data? The change in resistance needs to be converted to temperature, which then produces measurable data. 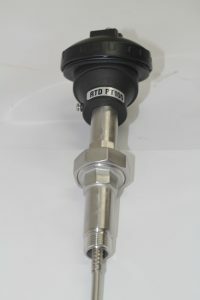 The other types of temperature sensors that are used include the Resistance Temperature Detectors (RTD) and integrated circuits. Each type of sensor has its pros and cons, and the application will determine the best instrument to use. From chip to rod shaped, there are a variety of shapes available for surface mounting or embedding. The shape is determined by the type of material that’s being monitored i.e. a solid, liquid or gas. They can be enclosed in resin/glass, baked on phenolic or painted depending on the application. For example, thermistor chips are mounted onto circuit boards whereas a bead thermistor can be embedded into a device. Whatever the application, maximum surface contact with the device that’s being monitored, and using a thermally conductive (not electrically conductive) paste or epoxy glue for connection is ideal. How does a thermistor operate in a controlled system? A temperature controller monitors the temperature of the thermistor which then instructs a heater or cooler when to turn on or off, in order to maintain the temperature of the sensor (thermistor), as well as the target device. They are used widely in applications such as air conditioning and display fridges/freezers – upon many more. The sensor has a small amount of current running through it (bias current), which is sent by the temperature controller. The controller can’t read resistance, so it must be converted into voltage changes, by using a current source to apply a bias current across the thermistor to produce a control voltage. To guarantee accuracy, the thermistor should be placed close to the device that requires temperature control, either embedded or attached. If the thermistor is located too far away from the device then thermal lag time will drastically reduce the accuracy of the temperature measurement, while placing the thermistor too far from the thermoelectric cooler (heats and cools the target device) reduces the stability. The closer the thermistor is to the device, the more quickly it will react to temperature changes and the more accurate it will be, which is key when exact temperatures are required. Once the placement of the thermistor has been determined, then the base thermistor resistance, the bias current, and the setpoint (desired) temperature of the load on the temperature controller need to be determined. How do you determine which resistance and bias current to use? Thermistors are categorised by how much resistance is measured at ambient room temperature i.e. 25°C; the manufacturer determines certain technical specifications for optimum use. Thermistors work best when measuring a single temperature within the range between -55°C and +114°C i.e. when measuring within 50°C of ambient; extremely high or low temperatures don’t get recorded correctly. Using a thermistor where the setpoint temperature is in the middle of the range is the best way to go. Depending on the bias current from the controller, each thermistor has an ideal range i.e. the temperature range where small changes in temperature are accurately recorded. The sensitivity of the thermistor is dependent on the temperature. For example, some thermistors are more sensitive at cooler temperatures than at warmer temperatures. The manufacture will specify the voltage limits of the thermistor feedback to a temperature controller. It’s best to choose a thermistor and bias current combination that produces a voltage inside the range allowed by the temperature controller, and ideally in the middle of the range. The temperature controller feedback input needs to be in voltage, which comes from the thermistor resistance; this generally needs to be changed to temperature. The most accurate way to convert thermistor resistance to temperature is by using the Steinhart-Hart equation. What is the Steinhart-Hart equation and how is it used? The Steinhart-Hart equation is a simple method for modelling thermistor temperatures easily and more accurately. It was a manual calculation that was developed prior to computers, but can now be calculated automatically using computer software. The equation calculates the actual resistance of a thermistor as a function of temperature, with extreme accuracy; the narrower the temperature range, the more accurate the resistance calculation will be. 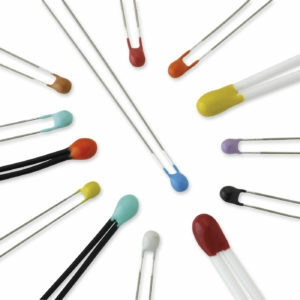 Thermistors change resistance with temperature changes; they are temperature-dependent resistors. They’re perfectly suited to scenarios where one specific temperature needs to be maintained, they’re sensitive to small changes in temperature. They can measure liquid, gas or solids, depending on the type of thermistor. They’re the best way to measure and control temperature of a thermo-electric cooler, as part of a temperature control system due to their capability to adjust in tiny increments. The closer the thermistor to the device that need to be monitored, the better the result will be; they can be embedded or surface-mounted to the device. Please note, thermistors come in a wide range of types. 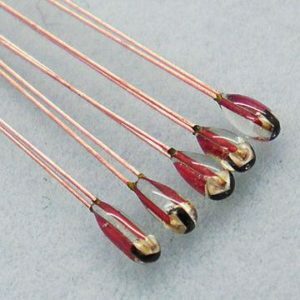 If you need a thermistor manufactured by Pyrosales – please have as much information as possible, including the value of the bulb. 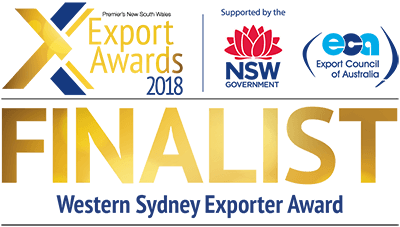 Contact us for more information, or call us on 1300 737 976.